Rebecca Busman, MA, is a Limited Licensed Psychologist. 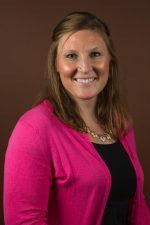 She earned her Bachelor of Arts degree in Psychology from Hope College and her Master of Arts in Counseling Psychology from Western Michigan University. She has been working in the field since 2007. She began her career in outpatient counseling at Catholic Charities, treating both adolescents and adults. She later went to work for the State of Michigan through the Department of Corrections until she again returned to outpatient counseling so she could pursue her true passion in working with clients with eating disorders. Rebecca has researched and practiced treatment in the areas of eating disorders, depression, bipolar disorder, anxiety disorders, family adjustment/life change events, psychotic disorders, trauma and self-harm/cutting. She enjoys working with adolescent and adult populations, including family dynamics. She has additional training in dialectical behavioral therapy used in the treatment of borderline personality disorder.